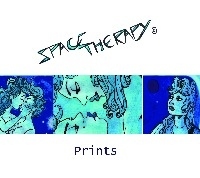 Welcome to the world of Space Therapy prints and cards! All cards are printed on 300gsm silk coated card and professionally printed. Each card is sealed in cello and sent in a cardboard backed envelope! All A3 posters are printed on 200gsm Silk Poster Paper. All posters are sent rolled at the time of purchase and sent in a 40cm cardboard tube!